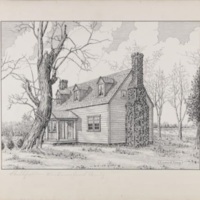 In the early- to mid-1930s, the Virginia State Commission on Conservation and Development’s Division of History and Archaeology received funds from the Works Progress Administration’s (WPA) Federal Art Project to commission five artists to create drawings for a publication on historic Virginia shrines. The artists applied for work through local emergency relief offices and were then assigned to the Federal Art Project. Under the direction of Hamilton J. Eckenrode, the commission’s Division of History and Archaeology began making a record of historic buildings in Virginia in 1932. Field assistant (and artist) Rex M. Allyn took photographs of buildings while on assignment to the Division’s Historic Highway Marker project. From 1932 to 1937, Allyn and four other artists—Edward A. Darby, Dorothea A. Farrington, E. Neville Harnsberger, and Elsie J. Mistie—each created numerous pen-and-ink and pencil drawings from the photographs. In some cases, the artists were asked to make adjustments to the architectural details to produce a drawing that more closely represented the original structure. Read more from Multiple Exposure. Citation: Darby, Edward Allen. Shellfield - Westmoreland County. 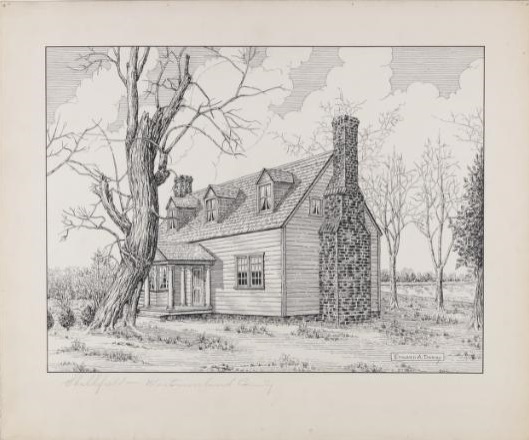 WPA Historic Houses Drawings Collection, 1932-27. Visual Sudies Collection. Library of Virginia. Up for Debate: Do you think that money spent on employing artists as part of the New Deal was money well spent? Why or why not? Analyze: Take a look through the other image in the WPA collection. What buildings from your own county would you have like to see included? Artistic Exploration: Look closely at the drawing of Shellfield. To what extent do you think it is an accurate and detailed representation of the strcuture? Be specific in your answer. 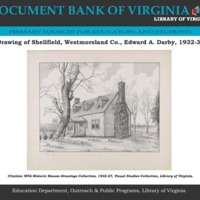 “Drawing of Shellfield, Westmoreland Co., Edward A. Darby, 1932-37,” Document Bank of Virginia, accessed April 21, 2019, http://edu.lva.virginia.gov/dbva/items/show/99.